Matthew McConaughey relished playing a "great slimeball" in "Wolf of Wall Street"
"Dallas Buyers Club" star Matthew McConaughey has been riding high on his latest string of successes. The 44-year-old actor is now up for an Academy Award for his portrayal of an HIV-infected man who turns a profit by selling illegal medicine to fellow patients. McConaughey went through a rigorous diet regimen for the role in order to look gaunt enough to realistically depict the effects of the fatal disease. So far, McConaughey has already taken home a Golden Globe and a SAG Award for his performance. But "Dallas Buyers Club" isn't the only film McConaughey has been getting praised for as of late. Matthew McConaughey on pressures filming "Dallas Buyers Club"
He also stars in Martin Scorsese's "The Wolf of Wall Street" as the cocaine-addicted Mark Hanna, who manages the young and impressionable Jordan Belfort, played by Leonardo DiCaprio, now competing against McConaughey in the best actor Oscars category. 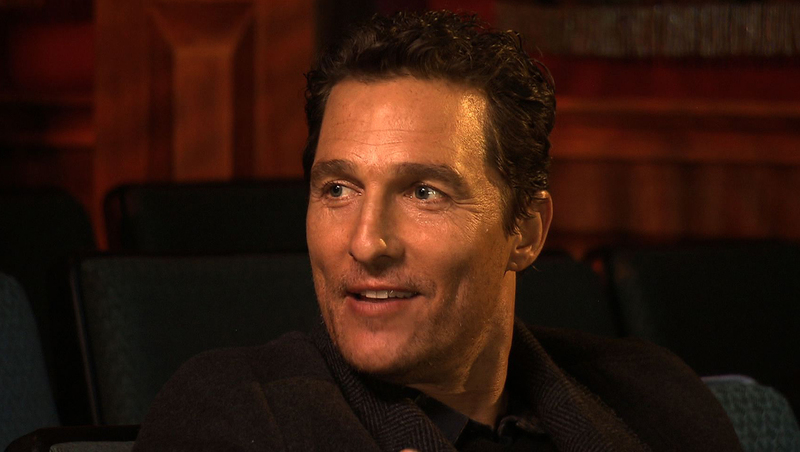 In an interview for "Sunday Morning" with CBS News' Lee Cowan, McConaughey said that he appreciated having both films released so close together. "'Wolf of Wall Street' comes out, which is another great reminder of this great slimeball I got to play in a highly comedic role," McConaughey said, "Which was a nice compliment to the dramatic role in 'Dallas Buyers Club.'" Watch video at the top of this story to see McConaughey discuss this banner year for his career. "The Wolf of Wall Street" is now playing in theaters. "Dallas Buyers Club" is now available on home video. The 86th Academy Awards will air Sunday, March 2 at 7 p.m. ET on ABC.